Bromus hordeaceus.Leo Michels – Source- http-//www.imagines-plantarum.de/ Public domain image.luirig.altervista.org (Accessed 11/2015). Bromus hordeaceus is an annual to biennial C3 grass (Wand et al. 1999), 30 cm to 1 m tall, stems often finely hairy; leaf sheaths hairy, ligule to 0.2 cm. 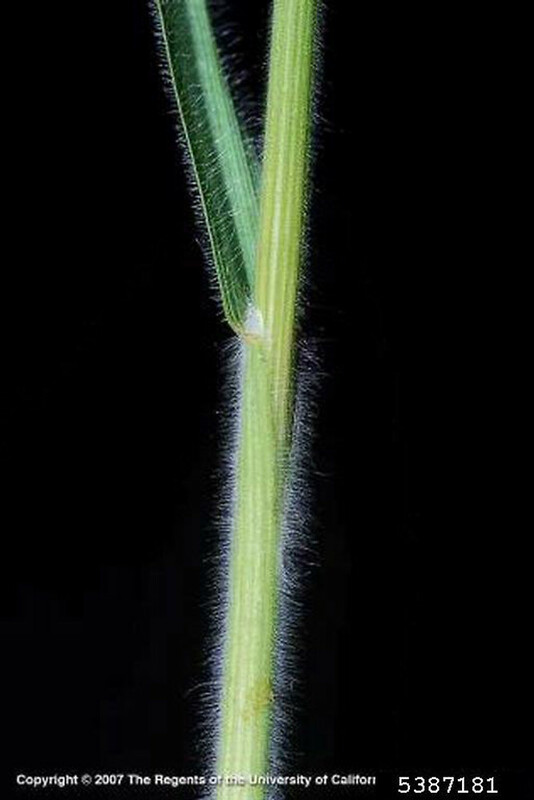 Bromus hordeaceus leaf and stem. By Joseph DiTomaso. Copyright © 2017 CC BY-NC 3.0. www.bugwood.org. New England Wild Flower Society. gobotany.newenglandwild.org (Accessed 11/2017). Leaves alternate, blades hairy, 0.2-0.6 cm. Flower spikelets 1-2.5 cm long, 6-9 flowers, usually softly hairy; glumes unequal, 0.5-0.9 cm, second glume often awned; lemma to 1 cm, apical teeth 0.1 cm, awn straight, 0.3-0.9 cm; inflorescence dense, erect, 3-10 cm, branches shorter than spikelets; blooming and fruiting May-July. Habitat: Roadsides, open, disturbed sites.